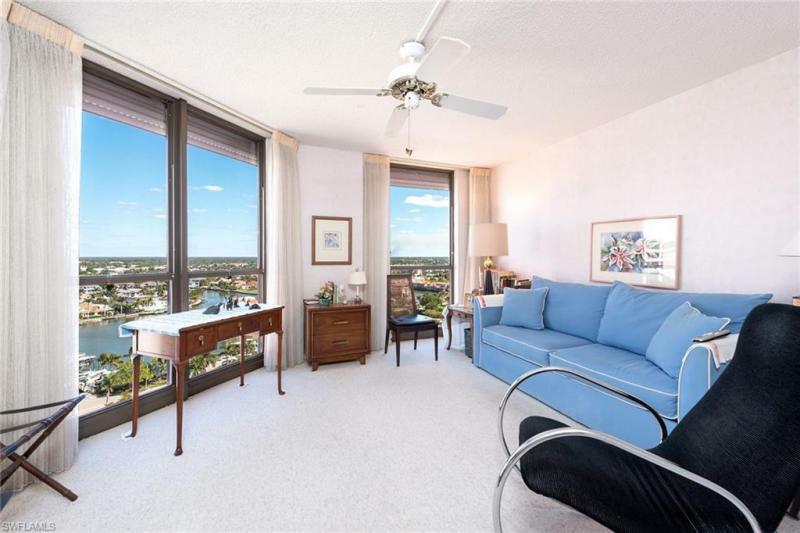 Totally remastered condominium with wide views of Naples Bay to the east in a boutique building with only 28 residences and easy beach access across the Boulevard. This home, renovated in 2017, is offered fully furnished in a comfortable, contemporary style with coastal touches. Details: 2 bedrooms and 2 baths plus open kitchen/great room/dining area in approximately 1, 617 square feet. The eastern lanai has sliders on the exterior and is encompassed in the main living space with private lanai space configured adjacent to the master suite; one covered, deeded parking space (#9); one outdoor storage closet (#12). The Miramar amenities include a manager on site, community pool and gazebo, grilling area and boat slips for lease by owners when available for $600/year. Boat access to the Gulf thru Doctors Pass is unobstructed by bridges.